Unfortunately, sooner or later we all have to say goodbye to our beloved pets. They may be lost to us when they cross the rainbow bridge, but they're never forgotten. I've set up this page so you can share the grief, the tears, the smiles, the good times,.. you've had with a fuzzy that has passed away. Although, times are changing and more and more people begin to realize that pets are true family members for a lot of people, there are still some seemingly heartless souls out there who don't understand what it's like to lose your best furry friend. If you feel up to it, if you need a virtual hug, feel free to create a page dedicated to any and all ferrets you've loved and lost. Recently or decades ago, young or old, it doesn't matter. Simply fill in the form below, I will take care of the rest. You can support other visitors who lost a ferret here. Then you can create a special in memoriam page right here for him or her. You can share a story about the fun times you had together, about how he or she died, write anything you like that can help you cope with losing your ferret. Do you have a picture of the ferret that died? If you like, you can share it here. Click the button and find it on your computer. Then select it. 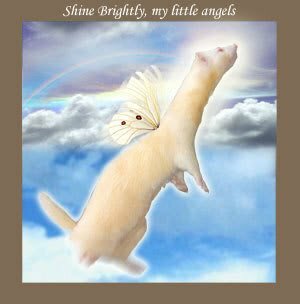 If you like, you can take a look at the pages of other ferrets that have passed away. It can help with your grieving process and you can share your feelings with others who are going through the exact same thing. it was tragic, but its over now. RIP Lola!